A company at its crux, is an artificial person created by law. It’s an association of individuals having a separate legal existence, perpetual succession and a common seal. It’s capital is generally divided into transferable shares, subject to certain conditions. There are many types of companies, the most popular of which are Private (pvt. ltd.) and Public (ltd.). 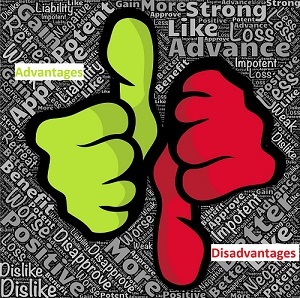 Both private and public limited companies have it’s own advantages and disadvantages. An entrepreneur has to choose the type based on his funding plans. 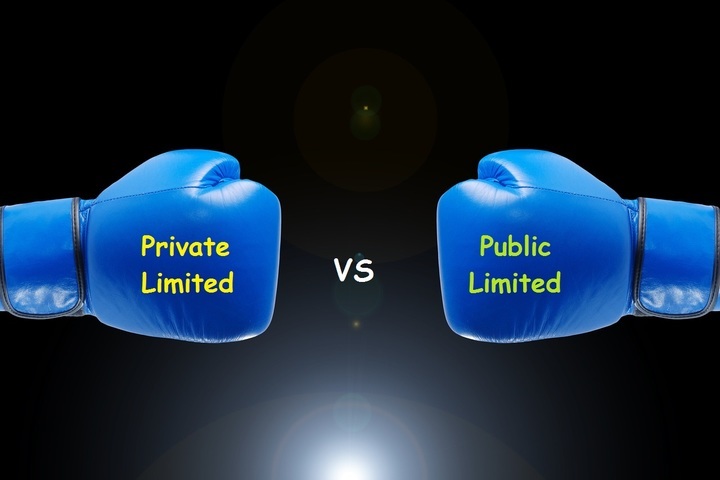 Let’s take a look at the key factors of both Private and Public ltd companies. A private limited company is a business entity that is held by private owners. This type of entity limits the owner’s liability to their ownership stake, and restricts shareholders from publicly trading shares. Members: You can start a private limited company with a minimum of only 2 members (and maximum of 200), as per the provisions of the Companies Act 2013. Limited liability: The liability of each shareholder or member is limited. This means that if the company runs into a loss, the company shareholders are liable to sell their company shares to clear the debt or liability. The individual or personal assets of shareholders or members are not at risk. Perpetual succession: As per company law, perpetual succession means that the company continues its existence even any owner or member dies, goes bankruptcy, exits from the business and transfers his shares to another person. Prospectus: Prospectus is a detailed statement that must be issued by a company that goes public. However, private limited companies do not need to issue a prospectus because the public is not invited to subscribe for the shares of the company. Number of directors: A private limited company needs a minimum of only 2 directors. At least one director on the board of directors must have stayed in India for a total period of not less than 182 days in the previous calendar year. The directors and the shareholders can be the same people. Capital: Minimum share capital required is only Rs. 1 lakh. The shares in a private limited company cannot be sold or transferred to anyone unless other shareholders agree on the same. There is no option to invite public to subscribe to the shares. It is mandatory that you should mention Pvt. Ltd. at the end of a company name. A public company is a company that has permission to issue registered securities to the general public through an initial public offering (IPO) and it is traded on at least one stock exchange market. A public company is not authorised to begin its business operations just upon the grant of the certificate of incorporation. In order to be eligible to run as a public company, it should obtain another document called a trading certificate. Members: In order for a company to be public , it should have a minimum of 7 members (maximum unlimited). Limited liability: The liability of a public company is limited. No shareholder is individually liable for the payment. The public limited company is a separate legal entity, and each shareholder is a part of it. Board of Directors: A public company is headed by a board of directors. It should have a minimum of 3 and can have a maximum of 15 board of directors. They are elected from among the shareholders by the shareholders of the company in annual general meetings. The elected directors act as representatives of the shareholders in managing the company and taking decisions. Having a bigger board of directors therefore benefits all shareholders in terms of transparency as well as fostering a democratic management process. Transparency: Private limited companies are strictly regulated and are required by law to publish their complete financial statements annually to ensure the true financial position of the company is made clear to their owners (shareholders) and potential investors. This also helps to determine the market value of its shares. Capital: A public company can raise capital from the public by issuing shares through stock markets. Public companies can also raise capital by issuing bonds and debentures that are unsecured debts issued to a company on the basis of financial performance and integrity of the company. Transferable shares: A public limited company’s shares are purchased and sold on the market. They are freely transferred among the members and the people trading on stock markets. Prospectus: For a public company, issuing prospectus is mandatory because the public is invited to subscribe for the shares of the company. Expensive: Going public is an expensive and time consuming process. A public company must put its affairs in order and prepare reports and disclosures that match with SEBI regulations concerning initial public offerings (IPO). The owner has to hire specialists like accountants and underwriters to take the company through the process. Equity Dilution: Any company going public is selling a part of the company’s ownership to strangers. Each bit of ownership that the owner sells comes out of their current equity position. It is not always possible to raise the amount of money that you may need to operate a public corporation from shares, so company owners should hold at least 51 percent of the ownership in their control. Loss of Management Control: Once a private company goes public, managing the business becomes more complicated. The owner of the company can no longer make decisions independently. Even as a majority shareholder, they are accountable to minority shareholders about how the company is managed. Also, company owners will no longer have total control over the composition of the board of directors since SEBI regulations place restrictions on board composition to ensure the independence of the board from insider impact. Increased Regulatory Oversight: Going public brings a private company under the supervision of the SEBI and other regulatory authorities that regulate public companies, as well as the stock exchange that has agreed to list the company’s stock. This increase in regulatory oversight significantly influences management of the business. Enhanced Reporting Requirements: A private company can keep its internal business information private. A public company, however, must make extensive quarterly and annual reports about business operations, financial position, compensation of directors and officers and other internal matters. It loses most privacy rights as a consequence of allowing the public to invest in its stock. Increased Liability: Taking a private company public increases the potential liability of the company and its officers and directors for mismanagement. By law, a public company has a responsibility to its shareholders to maximize shareholder profits and disclose information about business operations. The company and its management can be sued for self-dealing, making material misrepresentations to shareholders or hiding information that federal securities laws require to be disclosed.